Germany is a vast European country with plenty of attractions for visitors. We round up the most beautiful places in Germany from its busiest cities to picturesque German towns and villages. We also share the most beautiful castles in Germany and some stunning natural wonders to explore. Andrew and I have visited quite a few areas of Germany, but we still feel we’ve barely scratched the surface of this fantastic country. 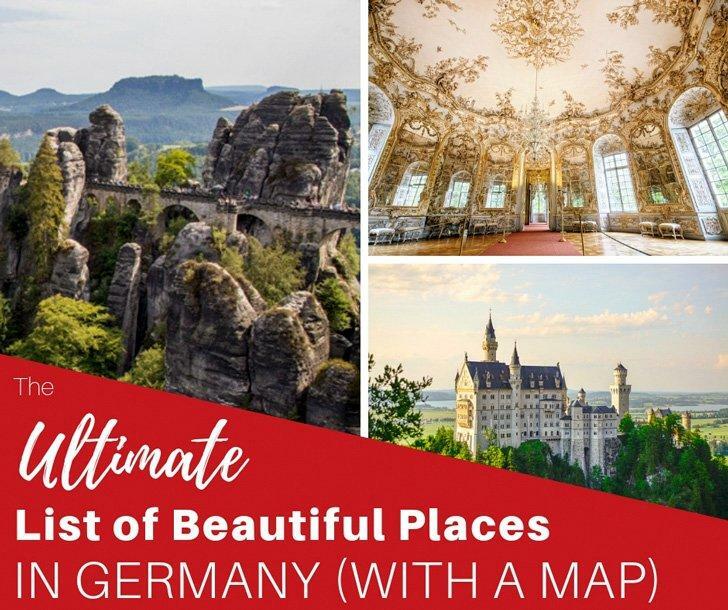 When I decided to round up the most beautiful places in Germany, of course, I reached out to our local expert, Adi, who added quite a few of her favourites to this list. But as even Adi hasn’t explored the entire country, we decided to ask some travel writing friends for their top places in Germany as well. Because this list is extensive, I’ve also added them all to a map you can explore at the bottom of this article. So dive in an prepare to discover our picks for the most beautiful places in Germany! 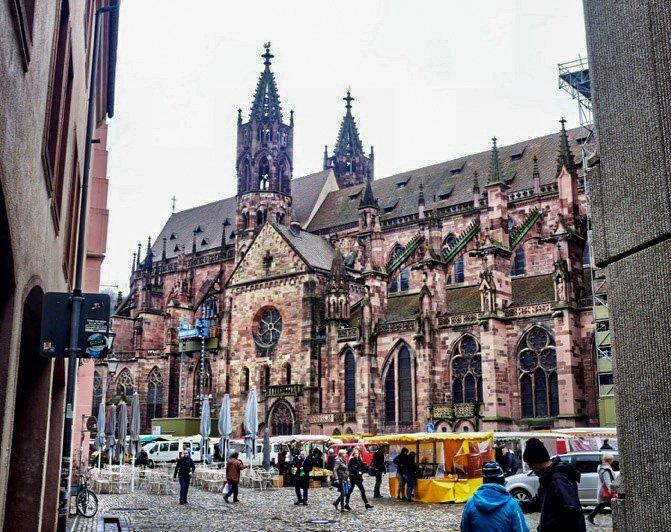 Freiburg im Breisgau is known for its beautiful Medieval Minster. Freiburg im Breisgau is a city in the south of Germany. It is mainly known for its Renaissance University, the medieval minster (the only gothic church in Germany which was finished in the Middle Ages) and the beautiful and romantic old town with its unique Bächl. The city is the perfect starting point for any trip into the Black Forest Region. One of the highlights is the artificially created, water-filled little canals (Bächle) running along the streets. Especially in summer, they are perfect for cooling down your feet after exploring the city. Kids (and also some adults) enjoy building or buying little boats and letting them float in the Bächle. Oh, and by the way, watch your step! A legend says, if you are single and fall in one of the Bächle, you will marry a person from Freiburg! Heidelberg is one of the most beautiful cities in Germany. 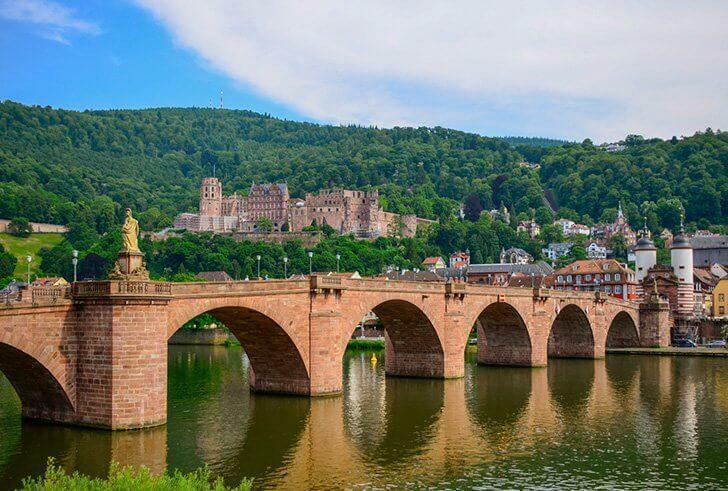 Heidelberg is a popular college town in southeast Germany surrounded by forested hills. 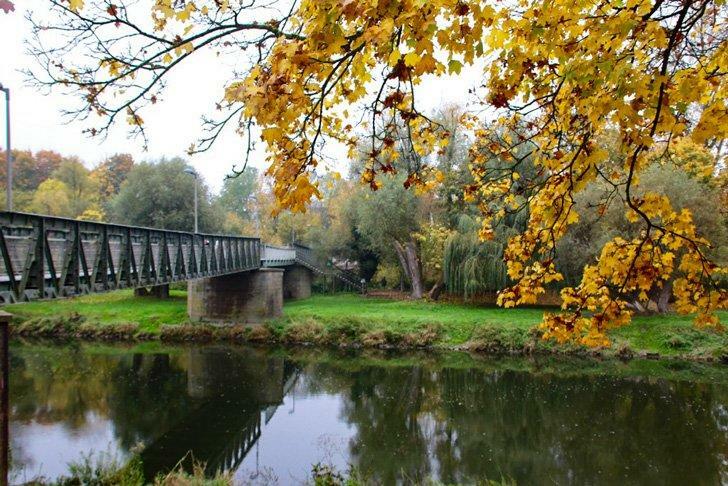 In the summer months, you can join the locals for a relaxing picnic or stroll by the river. Be sure to check out the Heidelberg Schloss; an ancient castle turned into an architectural museum. The funicular departs near the castle and will bring you to a vantage point with a view of the whole city and the colorful hills around. Head there in the fall for autumn colors or spring for beautiful blossoms everywhere. You can join a tour or explore on your own, but if you enjoy German beer, you’ll want to check out some of the local breweries and delicious restaurants. Heidelberg is an hour drive from Frankfurt international and makes a great stop on your way to the more popular Munich. Even during the winter months Stuttgart is one of Germany’s beautiful cities. 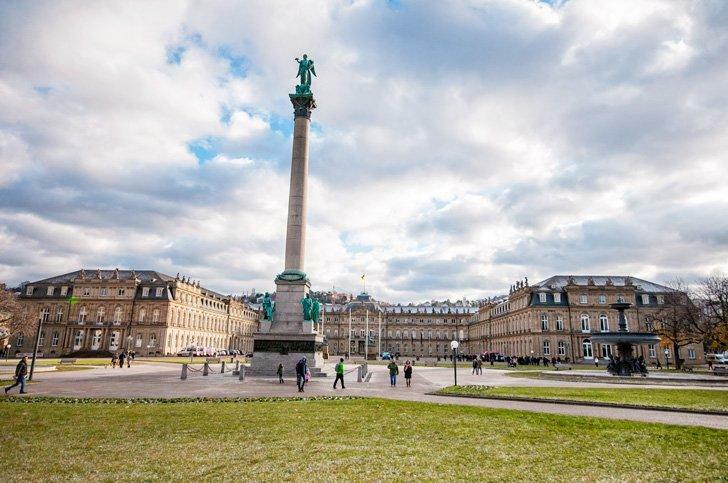 Stuttgart may just be one of Germany’s most under-rated cities, but it makes the perfect base for exploring the Baden-Württemberg region. The city’s central train station is a transportation hub and the perfect place to begin countless day-trips within Germany and the neighbouring countries. But don’t leave town too quickly, Stuttgart has a lively centre filled with things to do in its own right. Pick up your Pick up your StuttCard to save money on museums like the many art galleries, the Mercedes-Benz and Porche museums, and the historical Stauffenberg House. A day at the Wilhelma Zoologisch-Botanischer Garten is a family favourite and don’t forget to enjoy the excellent food-scene. 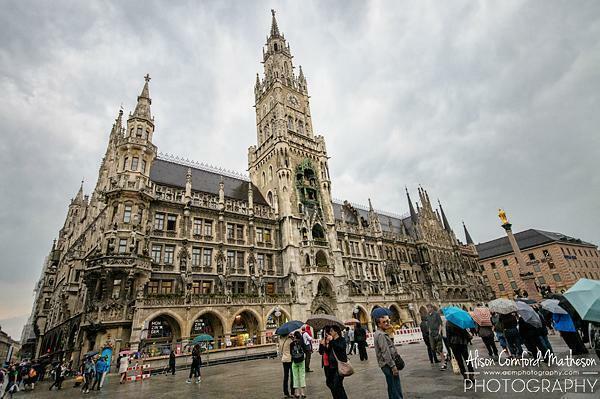 Tourists gather rain or shine, to see Munich’s Neuse Rathaus with the giant Glockenspiele. If I were pressed into choosing a favourite city in Germany, it would have to be Munich, a city that surprised and delighted me on many levels. Creatives will enjoy discovering the rich culture of design both modern and historic. Car-lovers can explore the World of BMW while history-buffs can wander through Schloss Nymphenburg or one of the beautiful churches from every architectural style imaginable. What surprised me the most about Munich, however, was its exciting (and delicious) food-scene. Not only are both traditional and modern German cuisines well-represented here; you can also feast on international meals from around the world including some of the best vegetarian cuisines I’ve enjoyed in Europe. Don’t miss the excellent food markets, both indoors and outdoors. 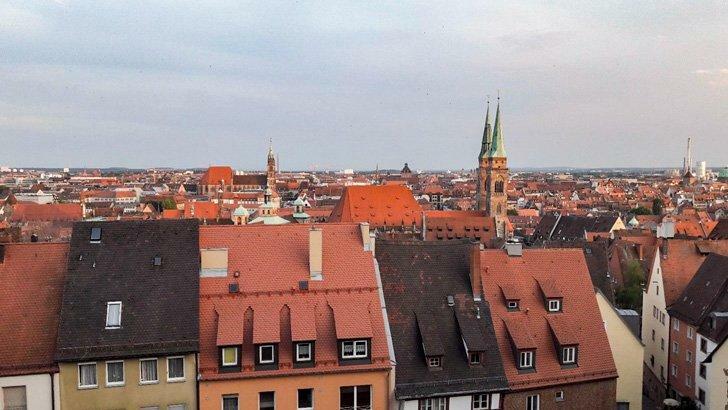 If you’re backpacking around Germany, you certainly shouldn’t miss visiting the city of Nürnberg in Bavaria. While Nürnberg isn’t as popular and well-known as tourist hotspots such as Berlin and Munich, it has much to offer. Nürnberg is full of beautiful churches in its old town, and visitors also should make sure to visit the Nürnberger Castle which offers a fantastic panorama of the city. Additionally, Nürnberg also played an important role in World War 2 and the Hitler regime. To learn more about the dark part of Germany’s history, head to the former Nazi Rally Grounds and visit the documentation centre. Nürnberg is especially well-known for its Christmas Market in December – one of the most beautiful and largest Christmas markets of the country! If you’re traveling to Germany in the advent time, a visit to Nürnberg is well worth it as well. The quaint and well preserved medieval city of Regensburg in Southeast Germany is well worth a visit. With its famous 12th-century, 16-arch stone bridge that crosses the river, you can imagine that was quite a feat to build back then. Right near where this stone bridge enters the Old Town is a famous sausage house, Regensburg Sausage Kitchen, that has been there almost as long! It is the oldest continuous public restaurant in the world! Take it to go or go inside and rest for lunch, as there is plenty of walking to be done here. As for me, I chose to spend my time souvenir and Christmas shopping in Old Town. And while you are at it, be sure and stop by my favorite German mustard store Händlmaier’s, where they have over 28 varieties of mustard in toothpaste-like tubes. Yes, that’s right, a store simply for mustard! That way, when you return to your home. You can remember how good those sausages were in Germany. Now you will have the perfect mustard to put on top of your sausages. Perhaps more than any other German city, Berlin has shaken off the shackles of its dark past and embraced a vibrant and artistic future. Artists have been flocking to Berlin for decades transforming this once gloomy political city into a colourful haven of free expression. Architecture, museums, galleries, and pop-up exhibitions will keep art-lovers busy for days. But Berlin hasn’t forgotten its past. Remains of the devastation caused by the World Wars and the infamous Wall stand as a tribute to the countless lives lost and serve as a reminder of the devastating cost of hatred and intolerance. Berlin’s nightlife is legendary and colourful but enjoying its quiet green spaces or a relaxing cruise on the Spree River is the perfect way to recover from a late night on the town. 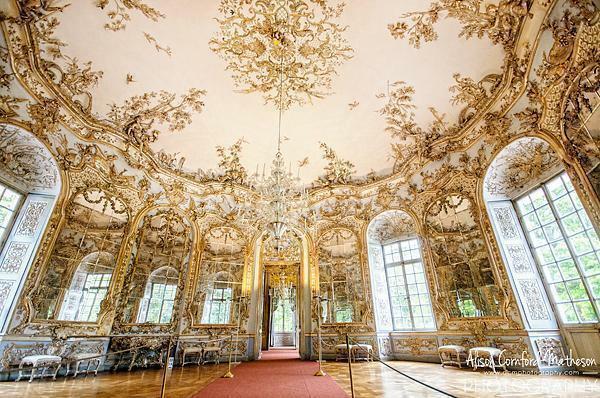 Sanssouci Palace in Potsdam is one of Germany’s most beautiful places near Berlin. Potsdam, the small city on the outskirts of Berlin, is up there with the most beautiful places in Germany. The city centre has many handsome buildings, but the main attraction is Sanssouci Park. It was laid out in the 18th century by Frederick the Great, King of Prussia. It includes a fine baroque flower garden and three palaces – the Rococo Schloss Sanssouci, the Neues Palais (New Palace) and Orangery Palace. There are many other amazing buildings in and around the Park, including the exquisite Chinese Teahouse. 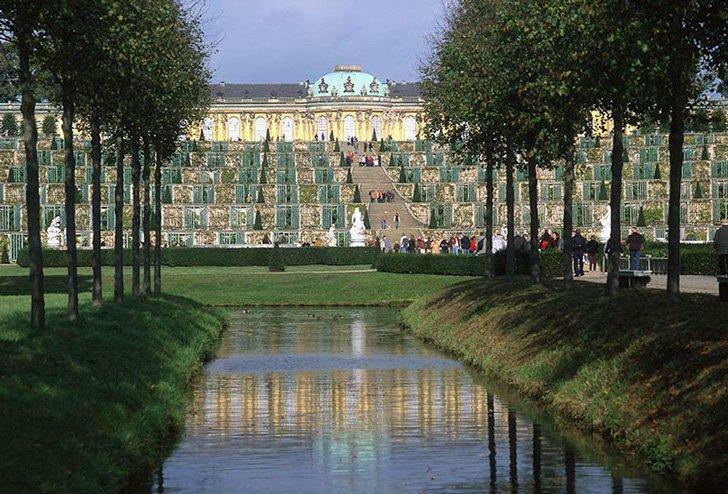 Sanssouci Park has been called the ‘Prussian Versailles,’ but it’s actually very different to its French counterpart. It’s part of a UNESCO World Heritage Site along with several other parks and gardens in Potsdam and Berlin. Hamburg is a green and beautiful city in Germany. As much as this city is industrial and famous for the perfect architectural mix between the old, the restored after the intense bombing suffered in the Second World War, and the new; Hamburg has a natural face few people know. We realized this when traveling on Hop on Hop off bus on our last trip. It was then when we were able to observe how green it is, the number of parks, ponds, and lakes it has for the rejoice of its locals, and how nature – and water – oriented it is. That’s what made me think maybe I should update my list of cities I would move to without hesitation and include Hamburg soon; because I would definitely live there. Hamburg is a beautiful city in Germany for photography. Hamburg is one of the biggest cities in Germany, and many travelers simply skip it – which is a huge mistake in my opinion. Whether you are a solo traveler, family, couple or photographer, Hamburg has something to offer for everybody. 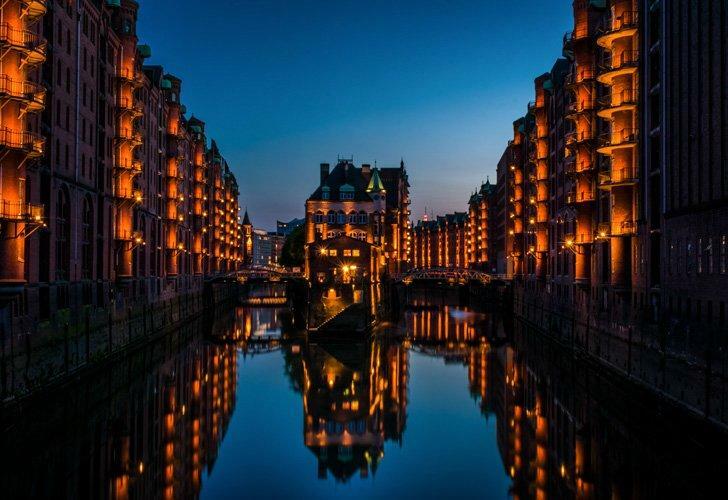 My favorite location in Hamburg is the Speicherstadt, where everybody should head once during his time in Hamburg. I highly suggest enjoying this beautiful place during sunset, as it is one of the best places to take images in Hamburg. Nearby you can also find the Miniatur Museum, which is extremely interesting and fun to watch. In general, Hamburg is a great city to have a good time – no matter what you are looking for. At first glance, Cologne may not seem like one of Germany’s most beautiful places. It was leveled during the war, and much of its central core is modern grey concrete. But look beyond its industrial facade, and you’ll find a city brimming with a vibrant culture, unique in Germany and known for its friendliness and hospitality. 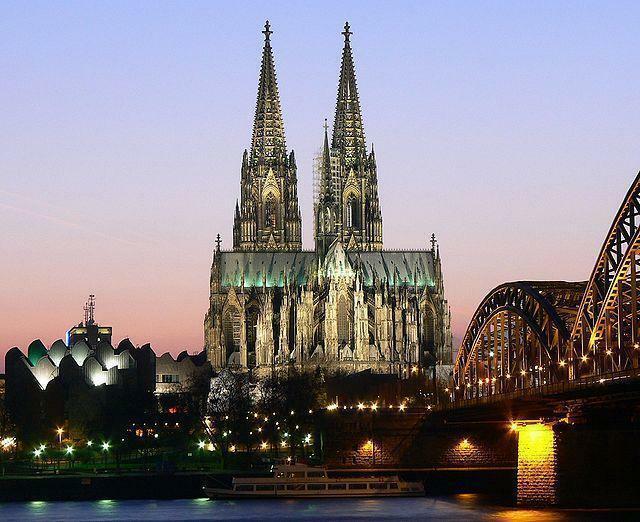 One thing no one can deny is the beauty of Cologne Cathedral, or the Kölner Dom, a UNESCO World Heritage site and a masterpiece of Gothic Architecture. Another beautiful place to explore is the colourful fish market area, dominated by Great Saint Martin Church which has been lovingly restored. Leipzig is a city in Eastern Germany that used to be the least developed region of the country after the unification of Germany. 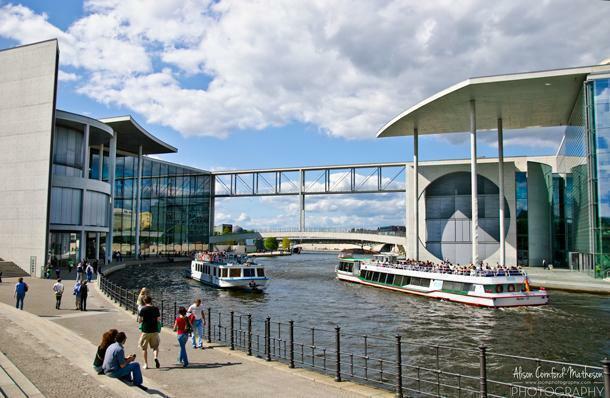 Since then, the city has been continuously developing and was recently named the most liveable city in Germany by the GFK research institution. What makes it such a good place to live? Leipzig has a great relaxing atmosphere. 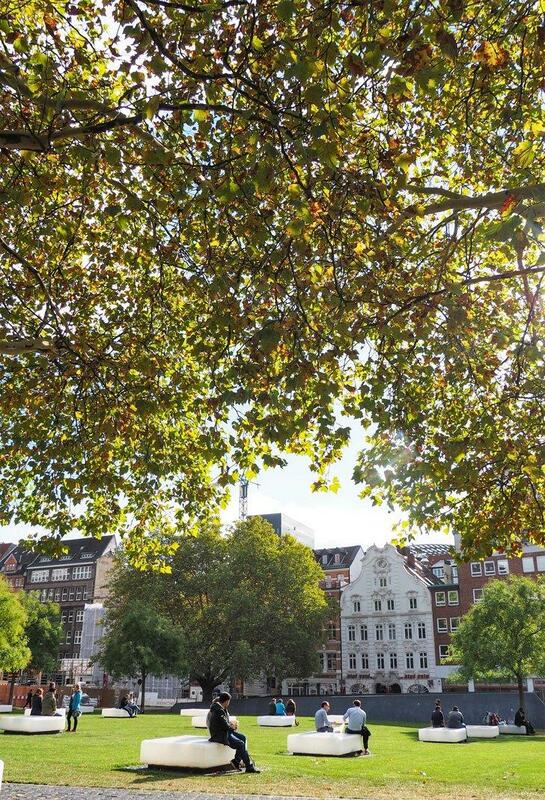 The city is full of parks, amazing architecture in the form of traditional German cathedrals and brick houses. 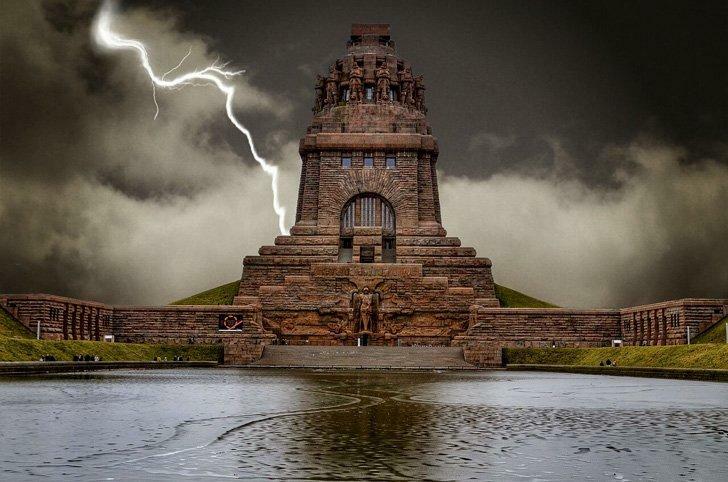 Perhaps, the most interesting landmark of the city and one of the greatest monuments in the world is the Monument to the Battle of the Nations devoted to a great battle that happened here in 1813, where about 600 thousand soldiers from 6 states died. It is an imposing building you need to visit in your lifetime. At the same time, Leipzig is a modern city with several hipster areas and one of the most gay-friendly communities in all Germany. You can go to Kolonnaden or Karl-Liebknecht street to grab a beer in one of the various bars and food in some of the restaurants with international cuisine. To relax, you can also go to one of the numerous parks like Clara-Zetkin park and Cospudener lake. Learn more about attractions of Leipzig. Dresden is a beautiful city in Germany to visit. 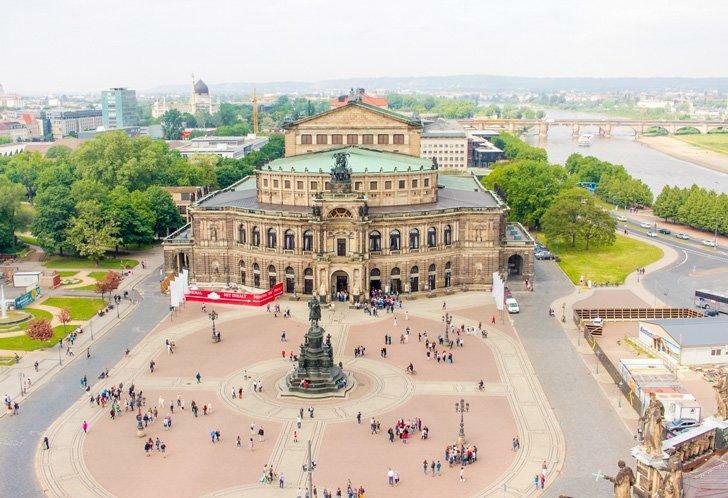 Dresden has been known through the centuries as “Florence on the Elbe.” The city in former East Germany is one of Germany’s most interesting and beautiful cities. The baroque architecture of the Old Town has been carefully restored to its former glory since the unification of East and West Germany. The Old Town is home to grand palaces, churches, and museums bursting with treasures and artwork. Across the Elbe river is the so-called New Town, though many buildings are older than in the Old Town. Here you can see the artistic and bohemian movement of the people trying to find their voice during harsh communist times. Through street art, a lively music scene and inventive use of community spaces. Lush city parks make Fall and Spring beautiful times to visit. The city heaves with festivals during the summer. However, it is Christmas when Dresden is at its most beautiful. It’s easy to see why I fell in love with the tiny town of Altensteig nestled in the Black Forest. Why go here? To witness the perfect picturesque medieval townscape. 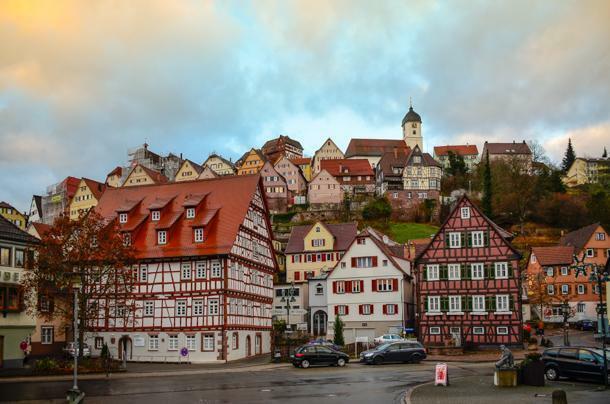 The town is perched on the top of a hill, and the colourful buildings feature some of the best examples of German post and beam construction. If you happen to be visiting in December, Altensteig’s Christmas Market is one of the most diverse and prettiest in Germany. 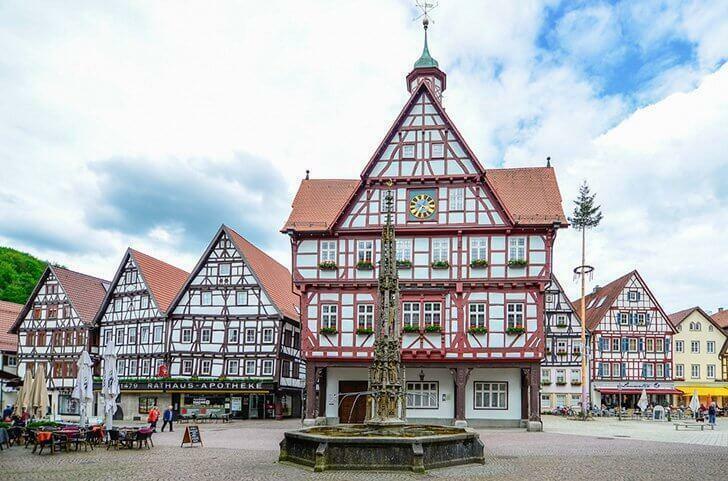 Bad Urach is one of Germany’s prettiest timber-framed towns. 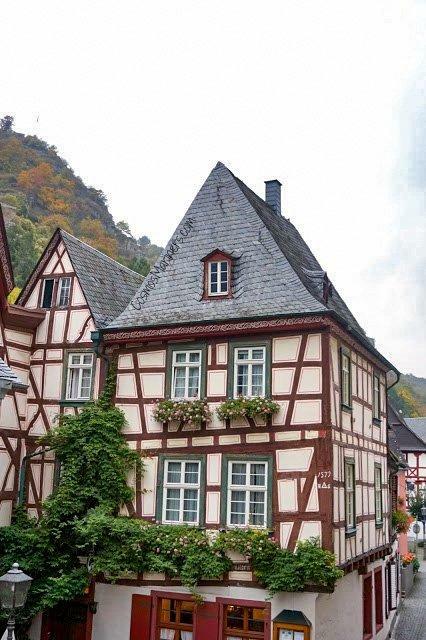 If you’re searching for the best-preserved examples of German timber-framed houses, Bad Urach should be on your must-visit list. This German spa town sits at the base of the Swabian Alps and has been a favorite relaxation spot because of its therapeutic baths. Hike to the Bad Urach waterfall for a beautiful natural escape or wander through the streets admiring the stunning architecture. Don’t miss the Urach Residential Palace a timber-framed masterpiece and home to the most extensive collection of Baroque sleds in the world. Meersburg is a picturesque German town. Another of Baden-Württemberg’s hidden gems, especially if you’re a wine-lover, is Meersburg. Its medieval old town is pedestrian-only, accessible by two sets of stairs. 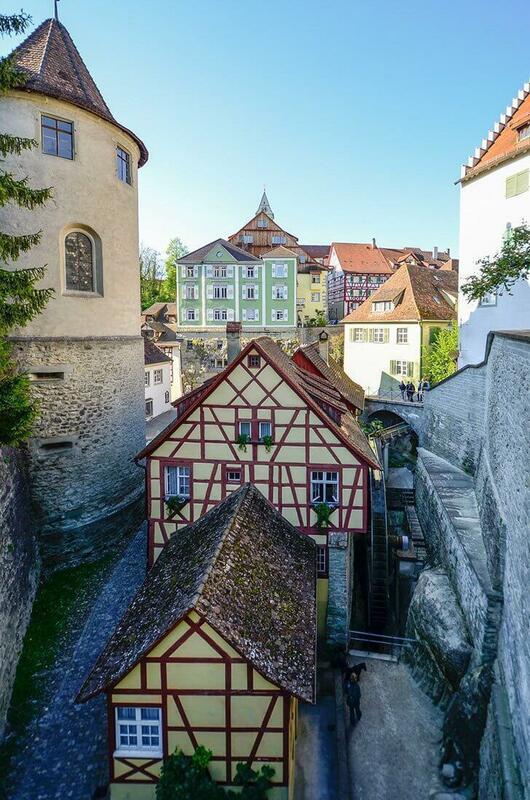 Meersburg is a stop on the “Deutsche Fachwerkstrasse,” or Timber House Road, and it is perched beside Lake Constance. The town is home to both a New and Old Palace overlooking the lake and town below. Recharge from your explorations (and stair stepping) with a wine-tasting and don’t forget to enjoy the view! 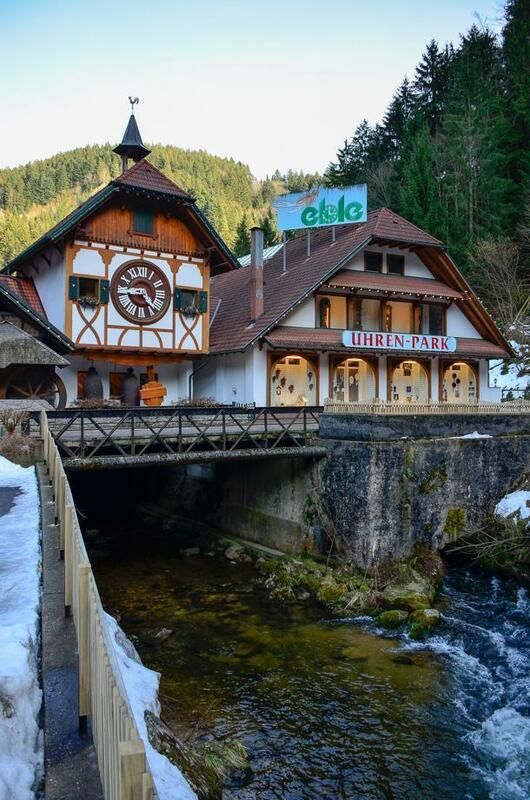 If you tried to imagine the most picturesque village in the Black Forest complete with cuckoo clocks, lederhosen and dirndls, traditional German food and breath-taking forest landscapes, including a romantic waterfall – you’d be dreaming up Triberg. Don’t miss visiting the Black Forest Museum to learn about the distinct culture and history of the region. Shop for classic Black Forest souvenirs from hand-made clocks to traditional clothing. Don’t forget to try some traditional delicacies like Black Forest ham, sausages, beer jelly, and the decadent Black Forest Cake. 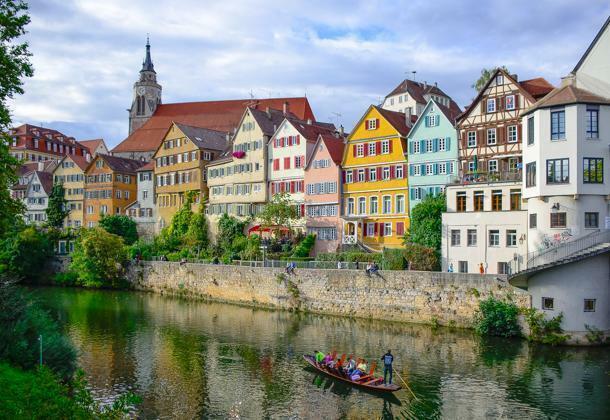 Tübingen is home to one of Europe’s oldest university towns and combines old-world charm and the vibrancy a youthful population offers. The best way to pass your time after exploring the old town is a relaxing picnic by the Neckar River followed by a boat ride through the centre. If you’re lucky enough to visit during September, you can eat your way through the Umbria-Provence Market hosted in the centre of Tübingen since 1995. Tübingen is an easy day-trip from Stuttgart. Welcome to UNESCO-listed Bamberg, Germany, in Bavaria! It’s not hard to see why UNESCO chose Bamberg as a World Heritage Site. Strolling the colourful streets lined with timber-framed buildings is the perfect way to while away a summer day. But there’s plenty more to do in Bamberg than just admire the architecture. 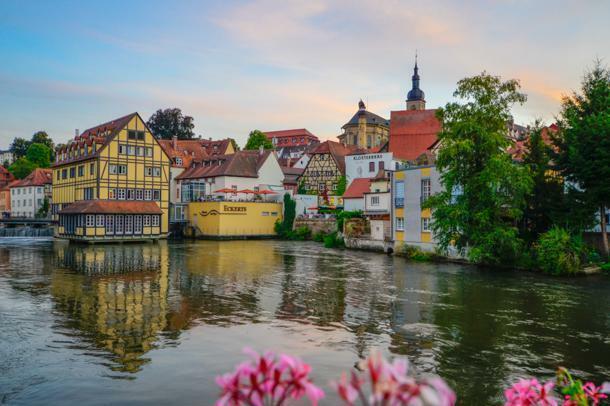 Visit the 13th century Bamberg Cathedral, admire the frescoes adorning the Old Town Hall, tour the New Residence Palace with its magnificent rose garden, check out the beer museum, or relax on a gondola tour of the river system. This perfect little town is ideal for a weekend getaway in Bavaria. Dinkelsbühl is a picturesque stop on Germany’s Romantic Road that remained untouched by the Second World War. It still looks much as it did when it was constructed in the Middle Ages, save a few modern conveniences. This colourful town is one of Bavaria’s walled cities build inside the depression caused by a meteorite impact. Dinkelsbuhl was also the film set of The Wonderful World of the Brothers Grimm. It’s no wonder this picturesque town was the setting for fairy tales. 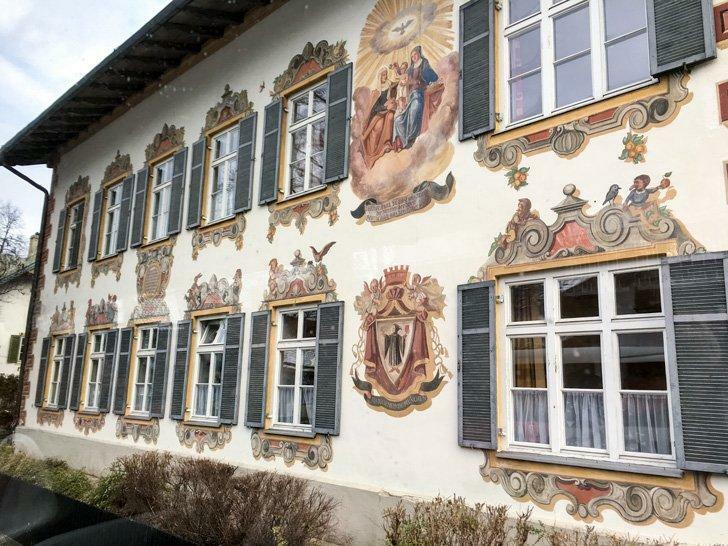 The painted architecture of Oberammergau makes it one of the prettiest towns in Germany. Oberammergau is one of the most charming and picturesque villages in the Bavarian Alps. The town is famous for its Passion Play; a tradition which dates back to 1634 when villagers vowed to tell the story of Christ’s suffering if they would be spared from the plague. Their prayers were answered, and villagers continue to fulfill this promise every ten years (the next performance will be in 2020). Visitors to the town will immediately notice the ornately painted houses (Luftlmalerei) featuring various religious and pastoral scenes. Don’t miss the beautifully decorated Pilatushaus and Oberammergau Church or head out of town for a day trip to King Ludwig’s palaces, Neuschwanstein and Linderhof. 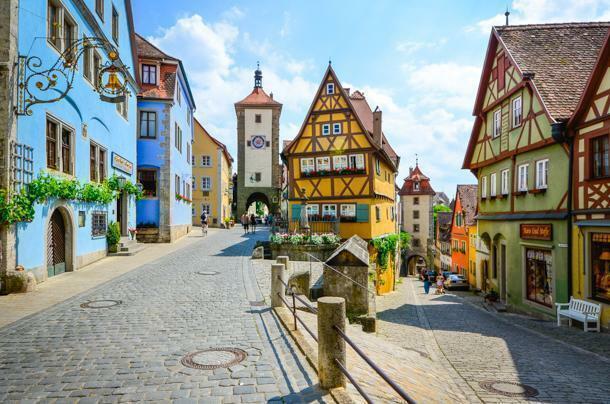 Rothenburg ob der Tauber is one of the picturesque Medieval walled towns on Germany’s Romantic Road. The narrow cobblestone streets of the town’s colourful centre feel like they haven’t changed in hundreds of years. Visiting Rothenburg late in the day means escaping the tourist onslaught from the many tour buses that visit during the high season. Don’t miss tasting the local schnapps, available to purchase in colourful pottery bottles that make great gifts. If you have a sweet tooth, get your hands on a schneeball (or snowball), a filled pastry made of flour, eggs, sugar, butter, cream, and plum schnapps, which has been around for three hundred years in the regions of Franconia. Spend a quiet day in pretty Michelstadt, Germany. 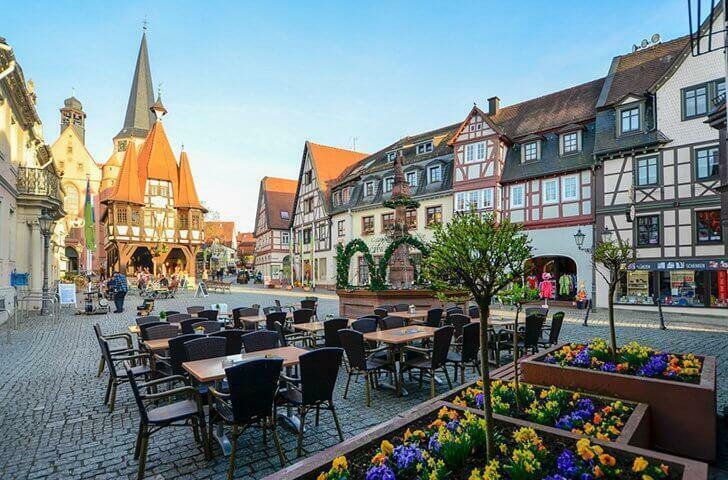 If you’re looking for a beautiful German town far from the tourist trail, look no farther than Michelstadt. The old town is peppered with timber-framed houses and is home to a number of small museums including an ivory museum, a motorcycle museum, and a toy museum. In the summer months, there are open-air theatre productions, concerts, and a variety of festivals celebrating everything from wine to bees. The Easter market featuring hand-decorated eggs is a highlight for the whole family. The crooked timber-framed houses of Hannoversch-Munden give it a quirky charm. 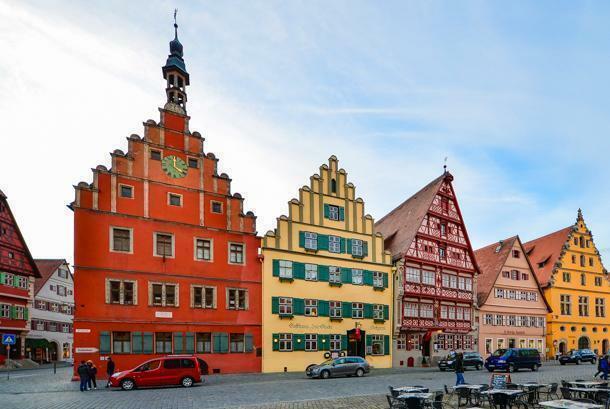 If you want to visit a well preserved small town in Germany, with rows of beautiful half-timbered “Fachwerk” houses, Hannoversch-Münden is our tip. Its strategic position, where the rivers Werra and Fulda merge to form the mighty Weser, meant it received “staple rights” in 1247. This privilege, usually reserved for much larger cities, meant that all river merchants had to unload their goods and offer them to local traders at favourable prices. 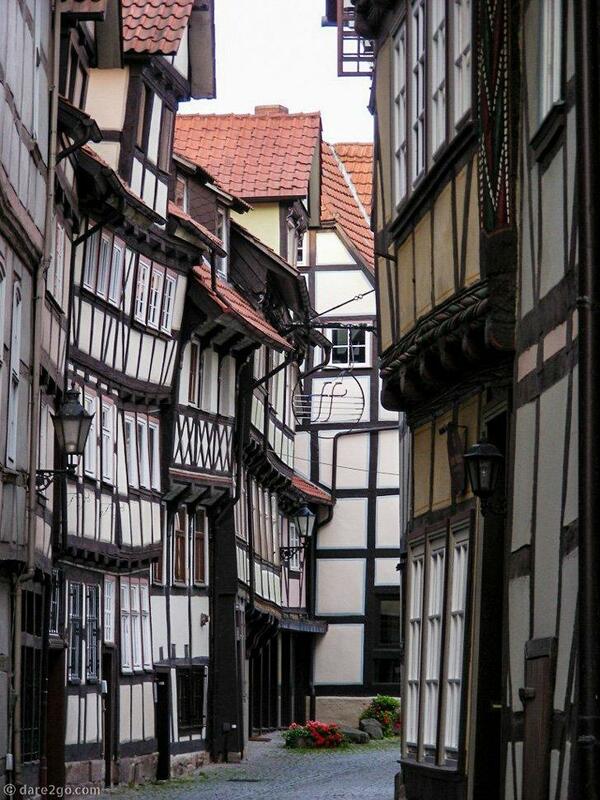 The resulting wealth shows in the elaborately decorated half-timbered facades, many over 500 years old, and the richly decorated Gothic town-hall. Its compact size means that you can easily stroll around town and explore its hidden corners. Hann.-Münden (as it is usually abbreviated) is also one stop on the German Fairytale Road; the (in-)famous Doctor Eisenbarth died here. It’s located about 30 kilometres west of Göttingen in Lower Saxony. The towns and villages of North Rhine-Westphalia differ greatly in character from their neighbours to the south. 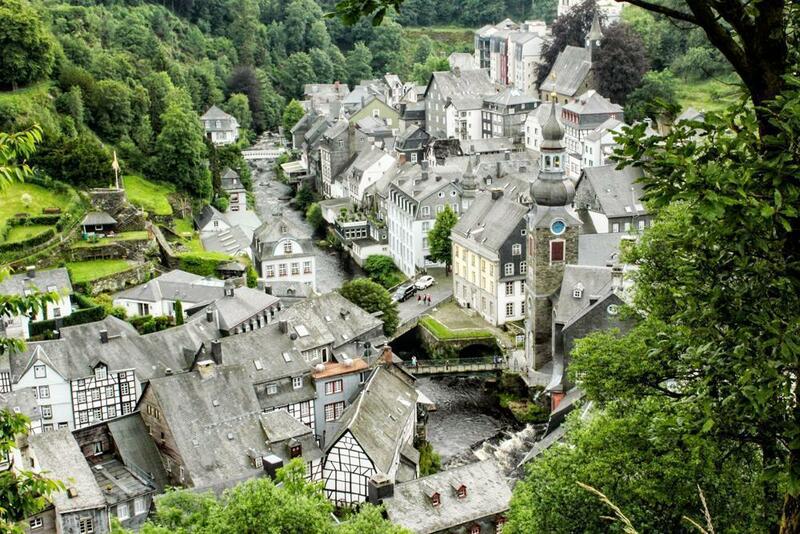 One of the most beautiful towns in the region is Monschau tucked on the border with Belgium. Like many other picturesque German villages, Monschau’s historic centre is timber-framed, however here the houses are all white with slate rooves making for a monochromatic symmetry. Monschau is located within the Hohes Venn – Eifel Nature Park, shared with Belgium, so it makes an excellent base for those who want to hike and explore this beautiful region. Monschau is also home to one of the most beautiful Christmas markets in Germany and makes a festive destination on December weekends. Bacharach is a beautiful village in Germany with timber-framed buildings. Germany has many stunning towns, but Bacharach captured my heart like none other. Located on the Rhine River, Bacharach has everything you might want in a little German town: historic buildings that never seem to have any perfect right angles, cobblestoned streets, ivy clinging to walls, and a half-ruined castle. The entire town is only a few streets, and you could easily walk through it in about an hour. But why would you want to when you can linger along the waterfront, dine al fresco at one of the restaurants, or take pictures alongside every building? We stayed in a small hotel above one of the restaurants in town, and it was as if we were staying with family: they invited us in, fed us, and made us feel welcome from the first moment. There aren’t any big museums here or any obvious tourist attractions, but that’s half of the charm. The draw here is to experience an actual German town, not one that’s been molded and shaped for visitors. The best part of Bacharach is Bacharach, and I hope that its historic charm never stops being the best thing about this sweet place! 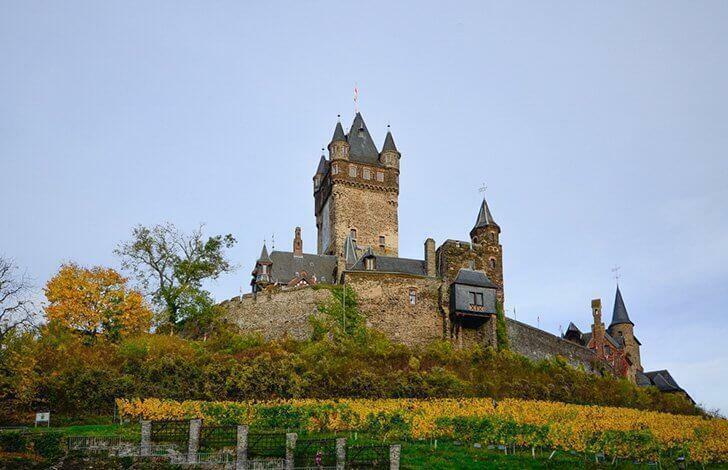 Visit beautiful Cochem Castle, an easy day-trip from Stuttgart, Germany. What are the essentials for a picture-perfect German town? Colorful houses with timber-framing lining both sides of the Moselle River – check! Hills with ancient terraced vineyards – check! 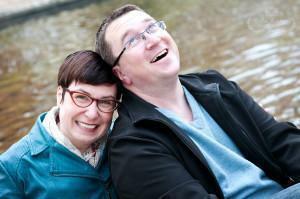 A romantic ruin to wander through – check! A perfectly preserved castle on the hill overlooking the scene – check! Cochem meets all these criteria and more. With dozens of buildings on the Directory of Cultural Monuments, this town of just over 5000 people packs plenty of bang for your buck. Spend the day exploring the architecture, tasting the local wine, or enjoying a cruise on the river. The imposing Heidelberg Castle in Germany. 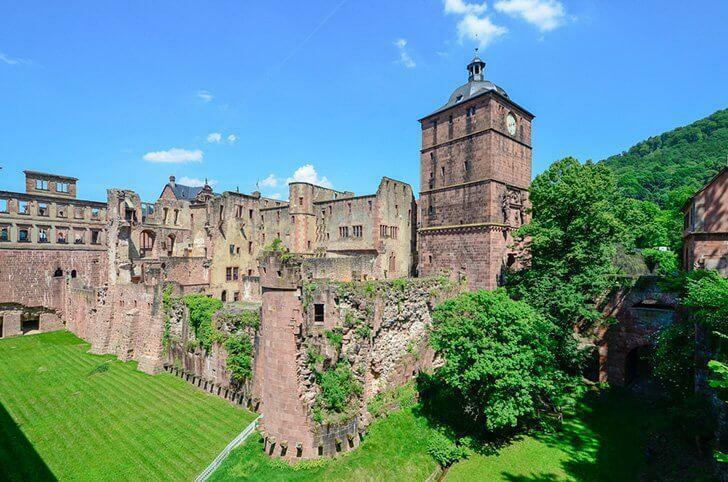 Heidelberg Castle is partially rebuilt, and part remains as a romantic ruin. This was one of the most important Renaissance buildings in the region, and with its sweeping views and beautiful architecture, it’s easy to see why. The castle is home to Heidelberg Tun, the world’s largest wine barrel. You can also visit the ruins of Hortus Palatinate, the castle’s garden which was Germany’s most magnificent Renaissance garden. The castle grounds are a great place to enjoy a family picnic and relax after a day of sight-seeing. Hiking to the top of ruined Hohenneuffen Castle can be challenging, but it’s well worth the effort. In addition to the vast castle grounds, you can enjoy food and drink in the onsite pub, while the kids can marvel at falconry shows and beautiful views of the surrounding foothills. The best time to visit is in the spring when you can admire the cherry blossoms dotting the landscape. This Gothic Revival castle would look at home in France’s Loire Valley. But instead, you’ll find it perched on a hill at the base of the Swabian Jura range. 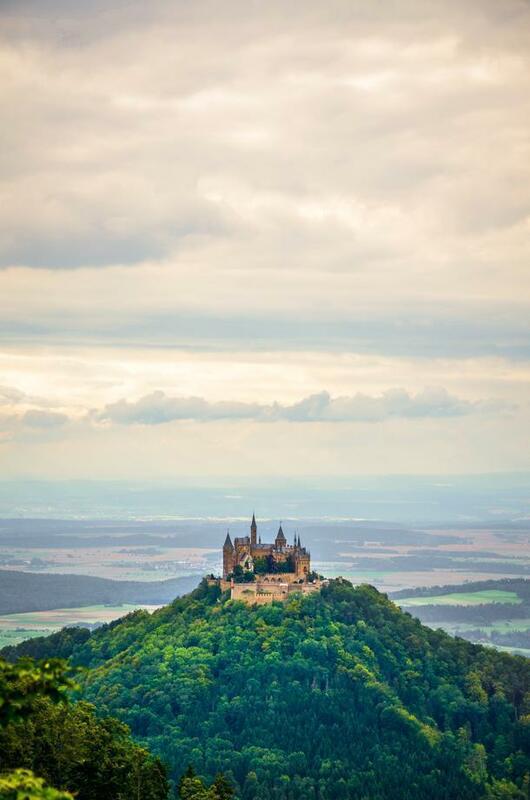 Hohenzollern is the third fortress built on this site that has been occupied since the 11-century, and with over 350,000 visitors per year, it’s one of Germany’s most visited. 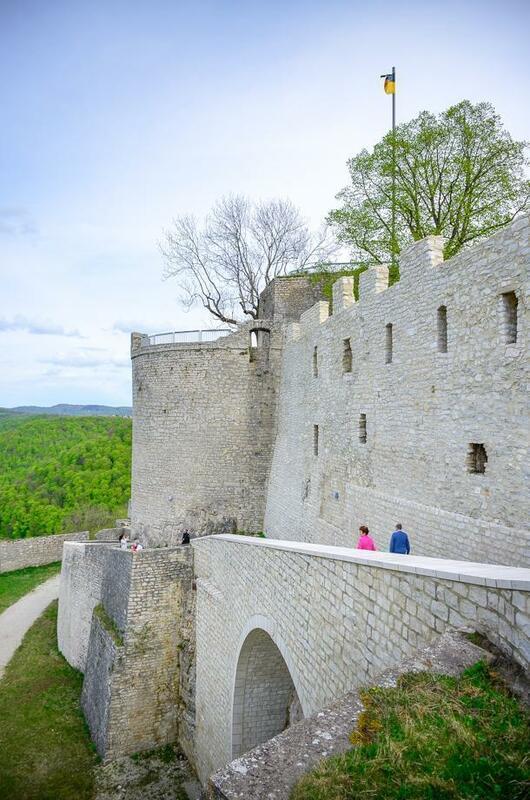 You can escape the crowds by getting to the castle early in the morning and enjoy a birds-eye-view of the site from Raichberg 1, 72461 Albstadt-Onstmettingen. 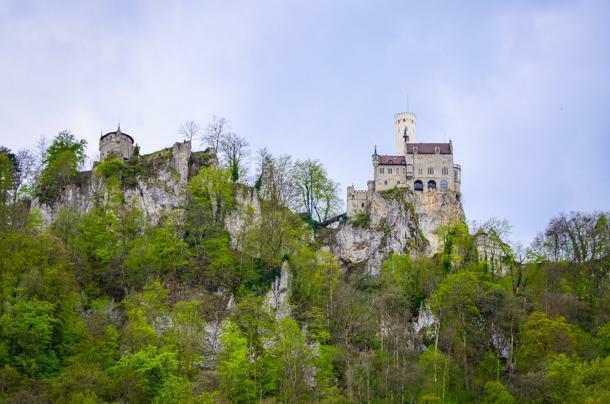 Lichtenstein Castle is still inhabited by royalty, but the Duke of Urach has opened part of his home to the public. This Gothic castle is home to an impressive collection of medieval weapons. The kids will enjoy the tree-top canopy walk, and the adults can enjoy the beautiful view. The interior of Ludwigsburg Palace. An easy day trip from Stuttgart, Germany. Ludwigsburg Palace looks more restrained from the outside than some of its Gothic counterparts. But don’t let that fool you. Its interior rivals the most ornate palaces in the world. 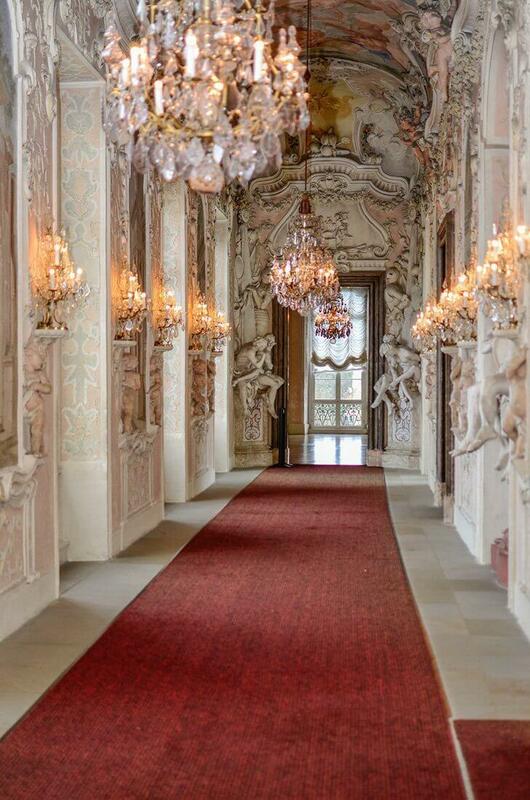 Its 452 rooms are decorated in styles ranging from Baroque and Rococo to Neoclassical. You can tour Ludwigsburg with a guide and learn about a variety of topics. One of my favourite areas was the stunning formal garden which is home to a variety of festivals including a fall pumpkin festival. The town of Ludwigsburg hosts a stunning Baroque Christmas Market which was one of the best my mother and I visited in 2017. 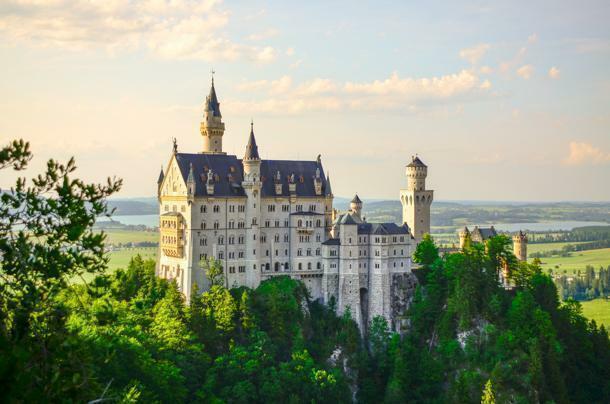 If you only know one beautiful German castle, it is probably Neuschwanstein, the inspiration for Disney’s Sleeping Beauty Castle. This gem of Bavaria sees 1.3 million visitors a year, so it’s hard to find a moment to yourself while visiting this beautiful castle. For an unobstructed view, head to Marienbrücke or Mary’s Bridge where you can admire the Romanesque Revival palace from a distance. Nymphenburg Palace and Park is one of the top sights in Munich, equally popular with locals and visitors. The stately baroque residence was the summer home of the royal Wittelsbach family and the birthplace of Ludwig II, who went on to build his own famous castle in Neuschwanstein. 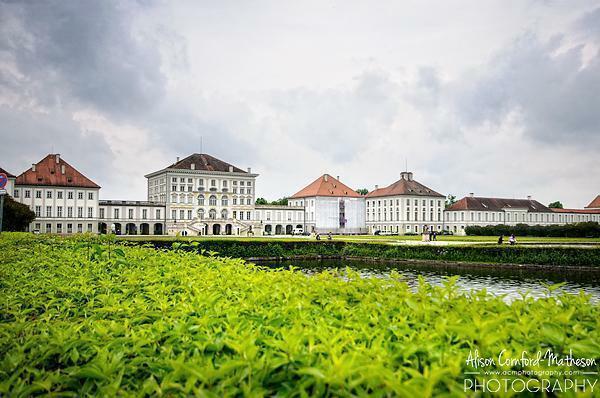 Surrounded by magnificent gardens and a forested natural area, the Nymphenburg complex also includes a renowned porcelain factory, museum of royal carriages and other conveyances in the former stables, residential apartments still occupied today, and a restaurant and beer garden. Several smaller “pleasure palaces” in the park include Amalienburg, a magnificent pink rococo confection, and the exotic Pagodenburg, which has chinoiserie elements. In Nymphenburg Palace itself, don’t miss the Great Hall, unchanged since 1758, and King Ludwig I’s salon – the “Hall of Beauties” – which contains a commissioned 19th-century portrait series of 36 women from all walks of life. 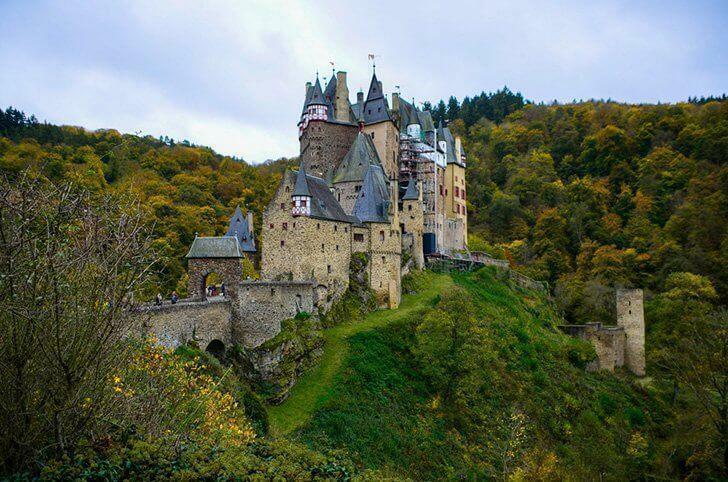 Burg Eltz is one of Germany’s iconic castles. Burg Eltz is one of only two castles on the left bank of the Rhine River in Rhineland-Palatinate that has never been destroyed, meaning this is one of the few castles in its authentic state. Eltz is one of Germany’s most iconic Medieval Castles, and it is still owned by a branch of the Eltz family. The surrounding Eltz forest is a nature reserve with hiking trails for visitors. The castle is open from April to October and visitors can tour the treasury and armoury in addition to several homes within the castle walls. Rheinfels Castle a beautiful castle in Germany. The ruins of Rheinfels Castle are the most impressive structures in the Middle Rhine Valley, which stand tall through the test of time. Overlooking the Rhine River and the town of St Goar, the castle has many well-preserved fortifications, passages, and towers that can be explored by visitors with or without a guide. 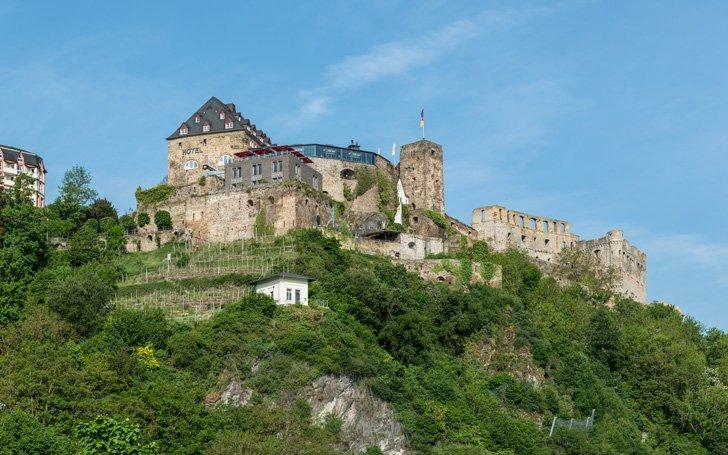 The castle was built in 1245 to protect the tax collectors of St Goar and the turbulent history wrapping the castle can be understood by visiting the Castle’s museum located in the former chapel. The castle in its original form is believed to have been five times the size of what remains now. A part of the fort now has been transformed into a luxury hotel. Hiking is a year-round activity in Germany’s Black Forest. The Black Forest is one of the most visited areas in Germany for good reasons, known not only for its beautiful mountains with dense forests and panoramic views, but also traditional villages making you feel you are walking into a fairy-tale town. The Black Forest or Schwarzwälder Schinken as in German is worldwide famous for producing the famous cuckoo clocks since the 1700s. This region located on the East side of the border with France and the Rhine river is one of the most beautiful places to visit during the whole year. Considering that Germany is mostly a flat land, one of the must do in this region is walking in the mountain range of the Black Forest, and for this, there are several trekking routes with different intensity levels. That’s why hiking as we know it today was invented in the Black Forest at the end of the 19th century when the first hiking maps and guides for the Schwarzwaldverein were published in Baden-Baden. Today, you can find not only walking and cycling paths but also vineyards and several spas around the Baden-Württemberg region. Karlsruhe is an excellent point to set up a base to explore the Black Forest. 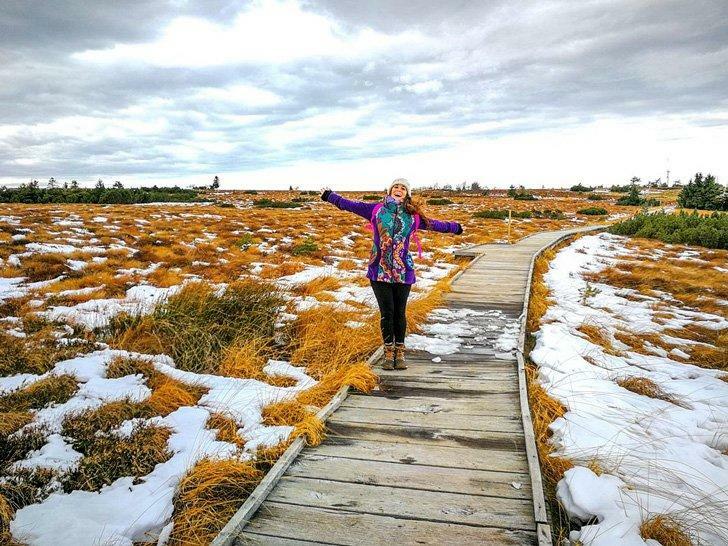 It’s also a perfect place for organizing day trips to explore the area walking in nature and experiencing the calm life of the region finishing your hike with a glass of wine or a slice the delicious Black Forest cake. It will taste way better here than anything you ever tried overseas. Imagine a lake peacefully nestled in the German Alps. A lake where the kings once ventured out for hunting parties. A lake where a mysterious mist is a natural and regular occurrence. This is the famous Lake Konigssee, or the King’s Lake in Bavaria, Germany. One of the most popular things that you should do at the Lake Konigssee is, of course, to take a boat tour on the lake. There are only two stops on the boat tour. The first is as St. Bartholoma where you can see the beautiful church of Saint Bartholomä. We also highly recommend that you go for a short hike along the edge of the lake to reach the so-called painter’s corner; and for those up for a more strenuous hike, tackle the 6 km climb up to the Ice Chapel (Eiskapelle). The second stop at the end of the lake at Salet is only open during parts of the year. But if you visit when it is open, make sure to stroll along the 15 min hike to the beautiful Lake Obsersee. To finish off your day, head up the Jennerbahn Cable Car (located in the same car park as the where you parked for Lake Konigssee) to get some beautiful views of the area from up high. 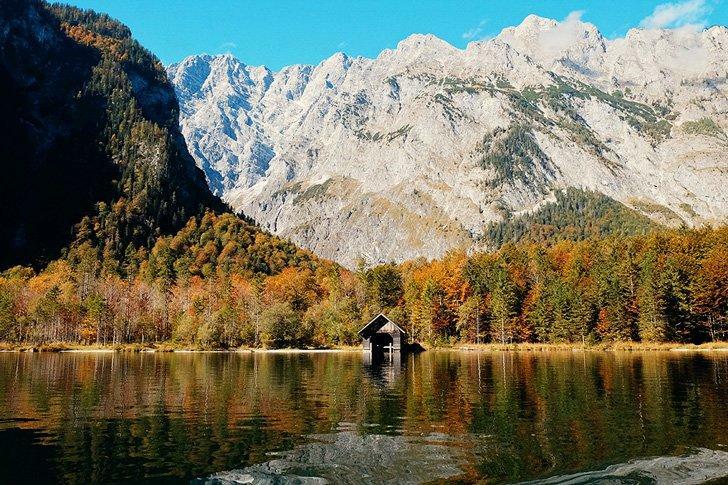 The scenery at the Lake Konigssee will leave you only speechless. My only recommendation is, make sure to bring a fully charged camera. You will need it here! 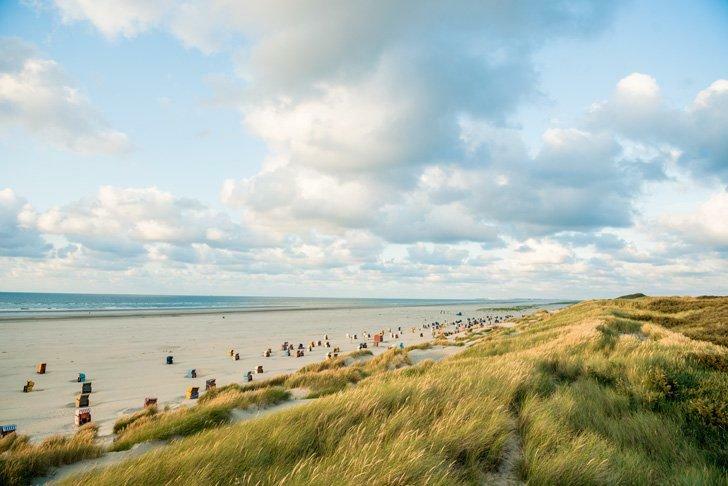 Don’t miss a visit to Germany’s beautiful Juist Island. 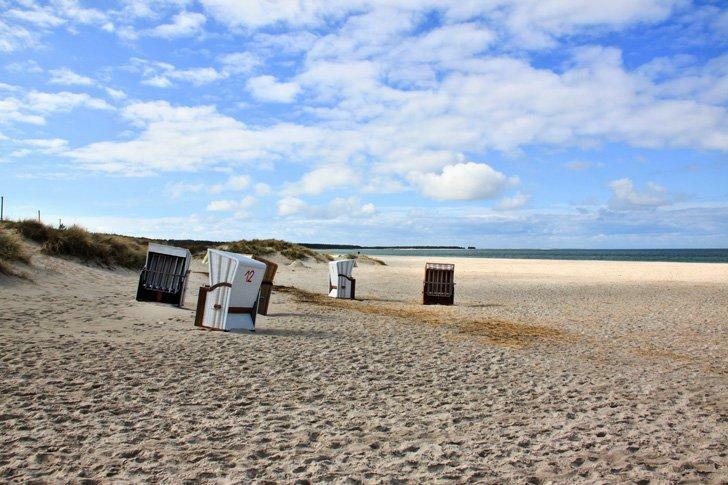 The East Frisian Island, Juist, is one of the most eco-friendly places in Germany. The slow movement has two meanings here since slowing down is inevitable on the island! On the one hand, there are absolutely no cars on Juist, except for emergency vehicles. People and goods move on horse-drawn carriages and bikes. On the other, the island is famous for tranquility, recreational holidays, and well-being. The salty air of the North Sea helps promote good health, and the natural surroundings help visitors unwind. Juist, furthermore, is a designated destination for Thalasso, the therapy of the sea. Due to the lack of traffic, there are numerous, beautiful cycling routes leading you to various breathtaking places on the island. They pass picturesque dunes and sandy beaches, the Wadden Sea, a lighthouse, small forests, lake Hammersee, a water tower, or the harbor. Visitors should not miss a mud flat hiking tour to learn about the UNESCO World Heritage-listed Wadden Sea and what it means to the fragile ecosystem of the island. Dubbed as the Sunny Island in the Baltics for receiving 1900 hours of sunlight throughout the year, Usedom is one the most beautiful places in Germany. It is a great island that features white sand beaches and beautiful nature. Usedom is a unique place- it is divided between Poland and Germany. If you decide to go there, you can visit two countries in one go! Just two and a half hours by car from Berlin, Usedom has become a major holiday destination for many Europeans on the mainland looking for an alternative to the beaches of South East Asia or Central America. The island features sugary-fine, white sand beaches that are lined by unique wicker chairs. Loungers relax on the beach and feel the breeze from the sea to experience the “wind therapy,” a term that was popularized by the island’s spa culture. Undeniably, there’s no need to look far and wide to enjoy a relaxing getaway on a beach. Before becoming mainstream, Usedom has a long history of being an exclusive go-to destination for the royalties and the elite. Indeed, luxurious accommodations and top-level spa facilities have since sprawled the island, especially the stylish seaside areas of Heringsdorf, Bansin, Zinnowitz, and Ahlbeck. Nowadays, more people are rediscovering this gem and giving themselves the same stylish treatment. Health and wellness centers are very popular on the island. Luxurious spas offer top caliber services done by highly trained personnel that uses only the latest technologies. These spas and some opulent hotels offer unique outdoor pools filled with thermal water sourced from local springs that supposedly have healing capabilities. This unique spa experience should not be missed when visiting the island. Other things to do in Usedom include cycling along the 5 miles of promenade lined with sophisticated architectures and beautiful views of the beach on the other side. Hiking is also a popular activity in its pine forests between the villages. Of course, the Baltic experience will not be complete without having a taste of their local delicacies that is based on fish, mostly herring. The town also hosts festivals and concerts every month that are a delight for those seeking a cultural experience. Saxon Switzerland National Park is one of the most unique and beautiful places in Germany. Just southeast of Dresden lies a breathtaking land full of natural wonder. Saxon Switzerland National Park is home to the breathtaking Elbe Sandstone Mountains which it shares with Czech Republic’s Bohemian Switzerland National Park. These majestic rock formations evolved from erosion that occurred hundreds of thousands of years ago. Though one of the most well-known locations within Saxon Switzerland has a human touch – the Bastei Bridge. What started as part of the wall protecting Neurathen Castle in the 1500s has evolved into one of the most prominent landmarks within the park. 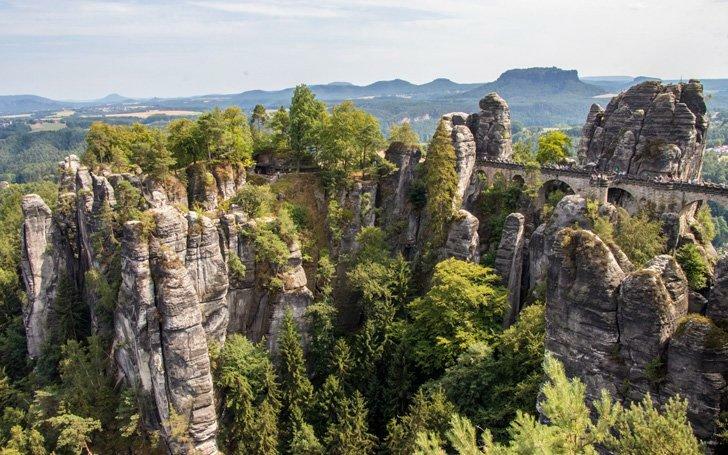 It’s also one of the most protected as the Bastei became the first nature reserve ever created within the Elbe Sandstone Mountains. Upon visiting, it doesn’t take long to realize how special this place is. From various lookouts, you can enjoy breathtaking views of the Elbe River and admire these amazing formations. Wandering its trails makes you feel as if you’ve been transported to another land. Be prepared though; there are plenty of hills, so it’s quite the workout! With over 400km of hiking paths awaiting its visitors, Saxon Switzerland National park is a favourite of locals and tourists alike. The best part? It’s less than an hour away from Dresden by S-Bahn! If you ever find yourself in beautiful Saxony, you should go for a hike to Bastei Bridge. Like for any hike, make sure you’re prepared: wear some comfortable shoes and, especially if it’s summer, don’t forget to carry some water with you and to put on some sunscreen. At the beginning of your hike to Bastei Bridge, you will have to cross a river by ferry (€1.20) and pass through a picturesque village. Afterward, getting to the top is going to take about an hour. You will have a stair-like path, which gets steeper by the minute, but the climb is worth it – all along the way, you will be amazed by the beautiful scenery. Before you actually get to the bridge, make a stop at Felsenburg Neurathen. Here, for €2.00 you can admire the majestic stone bridge from a distance, among other beautiful sights. Then, after exiting the paid area, you can pass on the Bastei Bridge itself. For the way back, you have several options, some longer than others. But the best thing is that the park is open 24/7, as is Felsenburg Neurathen. You can wake up late and take your time when visiting, but try to avoid going around noon, when it’s the busiest. Hainich National Park is one of Germany’s most beautiful parks. When you have your fill of castles and quaint medieval towns and want to get outside, Hainich National Park near Eisenach in Thuringia is a great destination. The park is part of the “Primeval Beech Forests of the Carpathians and the Ancient Beech Forests of Germany” World Heritage Site. 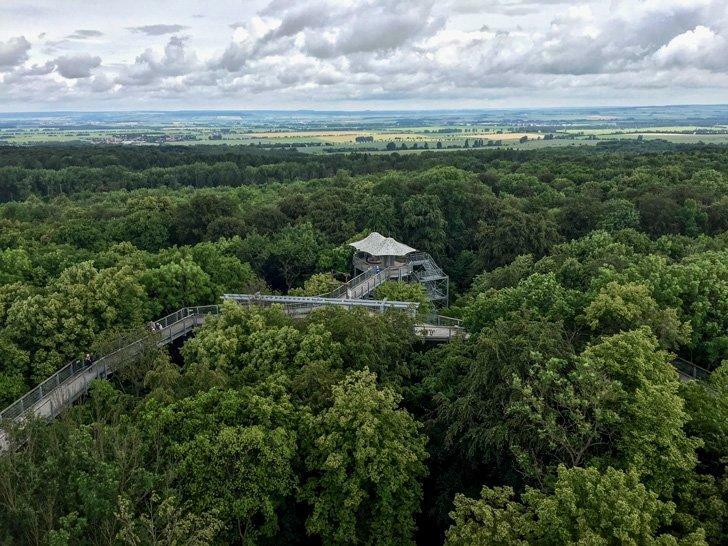 The best thing about Hainich is the canopy walk which will get you up into the trees. There is also a large observation tower you can climb which is connected to the walk. Kids and adults alike will enjoy the exhibits along the trail that explain life in the forest. There are also portions of the walk where the adventurous can opt for a rope bridge or other more fun route. Near the park entrance, there is also a great nature museum and a decent cafe. Hainich makes a great stop on your Germany road trip. 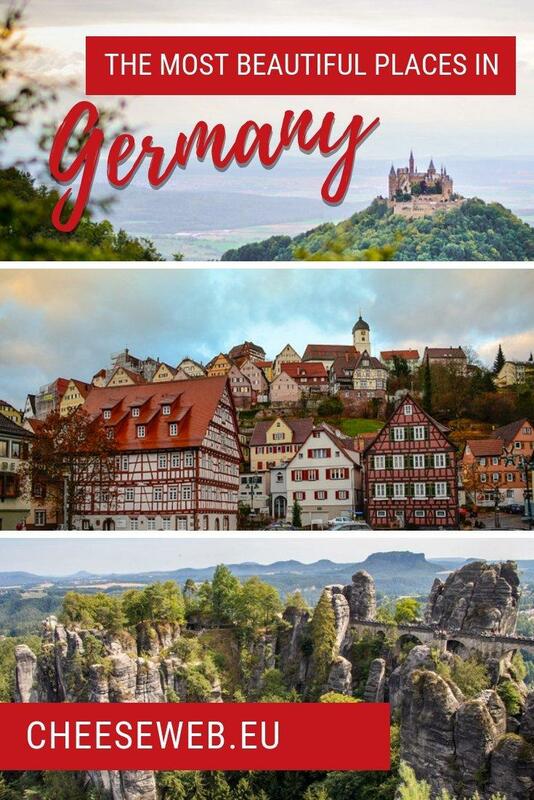 Click on the points on the map below to learn more about our beautiful places in Germany and plan your route for an epic German road trip!